Eric Müller of Deutsche Bank explains how consolidating banking relationships and taking maximum advantage of standardised channels can result in greater transparency and enhanced counterparty risk management. For the majority of corporate treasury functions today, counterparty risk management is the primary concern. The financial crisis and ensuing wave of regulation has led corporations to restructure in a way that will boost transparency, and give the CFO greater control over financial flows. This process is about breaking down silos, centrally pooling as much as possible so that cashflows of different currencies between various subsidiaries can be easily monitored. Perhaps the most significant factor in this regard, especially for multinationals dealing with multiple currencies and sets of regulations, is having the right banking partnerships. According to Eric Müller, head of global network banking and cash management corporates, EMEA at Deutsche Bank, partnering with a few large, well-integrated banks is the best way forward. "The key to greater visibility and control is actually very simple," he explains. "Concentrate the vast majority of your operating and financial cashflows, in the various global currencies, in one or a few very strong network banks per region. Or, depending on your cashflow structure, select one strong global network and relationship bank for global cash-pooling per key currency." Having just a few accounts with consolidated surplus cash balances, or overnight working capital balances, offers a high degree of central control. This in turn leads to increased visibility and greater operational efficiency. In the case of less commonly used currencies, particularly local ones, management through FX payments and collection tools via their base accounts can be the best way forward. "This process is about breaking down silos, centrally pooling as much as possible so that cashflows can be easily monitored." "At least 95% of the potential benefits related to cash-pooling can be realised through this approach," Müller says. "Then you can focus on the easy questions, but those that require inside knowledge such as: how does the cash forecast per key currency look over the next few days? Does it make sense to swap currency balances for a while? And, if so, for how long?" Domestic cash-pooling across various resident entities in the relevant local currency is possible in most countries. But in the case of non-resident parties, many major emerging-market players such as Russia, India and China have regulatory barriers in place. As a result, subsidiaries often resort to making tax-relevant dividend payments or taking advantage of local cash investment vehicles. Müller is confident that government policy on cross-border flows is becoming more flexible. In China, for example, a pilot project is underway that could result in a major push towards liberalisation. "Chinese corporates, as well as domestic subsidiaries of multinationals, have a lot of cross-border trade flow," he explains. "This pilot scheme enables corporates to handle Renminbi (RMB) funds outside the country and convert them into different currencies, such as the US dollar and euro. Deutsche Bank is very proud to be one of the few banks invited to take part." More efficiency in cash and FX management has been aided by greater standardisation. Corporates can easily be linked to platforms such as 360T, FXAll, etc for their FX trading, and payment and collection formats such as XML are becoming virtually interchangeable. Around 10% of total SWIFT participants are now corporations, with numbers rising all the time, and SEPA has led many companies with multiple European subsidiaries to consider forming in-house banks. By consolidating banking relations and taking full advantage of these harmonisation efforts, corporations achieve the highest degree of visibility and efficiency. "As long as they rely on financially stable, strong global network banks that provide corporate treasury services based on newly established global standards, CFOs are in a comfortable position," Müller says. "Given the current public debt crisis in the western hemisphere, counterparty risk management and flight-to-quality are more important for corporations than yield. We nevertheless offer a huge variety of cash investments locally and centrally, in all relevant currencies and across all major asset classes." Companies are under pressure to ensure their short-term solvency, while handling payables and risk on a global scale. A few strategic changes can go a long way towards achieving these goals. 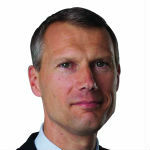 Eric Müller, head of global network banking and cash management corporates, EMEA at Deutsche Bank.